This is currently the latest API version (v4). Only Relevant Card Information is now returned (e.g. No ATK/DEF values for Spell/Trap cards) - See Updated Response Information. Random Card Endpoint Added - See Below. Format Parameter added (GOAT, OCG GOAT, Speed Duel) - See Card Information. Our Yu-Gi-Oh! API is now available for public consumption. Below are the details on how to use the API and what kind of response is to be expected from the API. 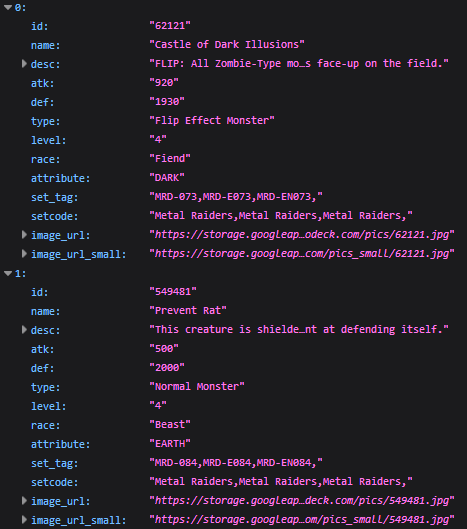 Please download and store all data pulled from this API locally to keep the amount of API calls used to a minimum. Failure to do so may result in either your IP address being blacklisted or the API being rolled back. Rate Limiting on the API is enabled. The rate limit is 20 requests per 1 second. If you exceed this, you are blocked from accessing the API for 1 hour. We will monitor this rate limit for now and adjust accordingly. Our API responses are cached on our side. The cache timings will be given below. These are subject to change. While our API is and always will be completely free to use, please consider white-listing YGOPRODeck.com on your adblocker. This is the only endpoint that is now needed. You can pass multiple paramters to this endpoint to filter the information retrieved. name - The exact name of the card. You can also pass a card ID to this. fname - A fuzzy search using a string. For example &fname=Magician to search by all cards with "Magician" in the name. type - The type of card you want to filter by. See below "Card Types Returned" to see all available types. atk - Filter by atk value. def - Filter by def value. level - Filter by card level/RANK. race - Filter by the card race which is officially called type (Spellcaster, Warrior, Insect, etc). 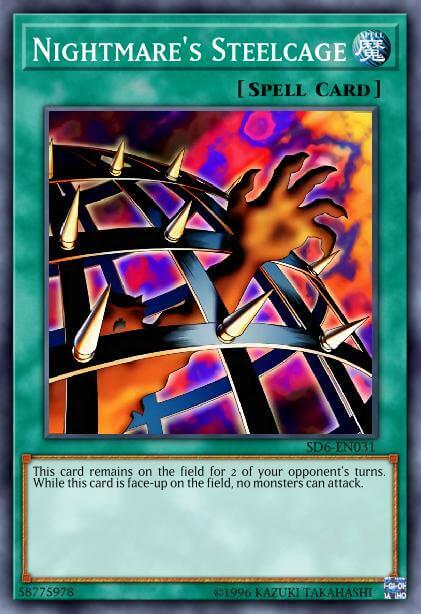 This is also used for Spell/Trap cards (see below). attribute - Filter by the card attribute. link - Filter the cards by Link value. linkmarker - Filter the cards by Link Marker value (Top, Bottom, Left, Right, Bottom-Left, Bottom-Right, Top-Left, Top-Right). scale - Filter the cards by Pendulum Scale value. set - Filter the cards by card set (Metal Raiders, Soul Fusion, etc). archetype - Filter the cards by archetype (Dark Magician, Prank-Kids, Blue-Eyes, etc). banlist - Filter the cards by banlist (TCG, OCG, Goat). sort - Sort the order of the cards (atk, def, name, type, level, id, new). format - Sort the format of the cards (goat, ocg goat, speed duel). la - Filter the cards by Language (See Languages below). The specific results from this endpoint are cached for 2 days (172800 seconds) but will be manually cleared upon new card entry. id - ID or Passocde of the card. name - Name of the card. type* - The type of card you are viewing (Normal Monster, Effect Monster, Synchro Monster, etc). atk - The ATK value of the card. def - The DEF value of the card. level - The Level/RANK of the card. race - The card race which is officially called type (Spellcaster, Warrior, Insect, etc). attribute - The attribute of the card. type* - The type of card you are viewing (Spell Card or Trap Card). race - The card race which is officially called type for Spell/Trap Cards (Field, Equip, Counter, etc). scale - The Pendulum Scale Value. linkval - The Link Value of the card if it's of type "Link Monster". 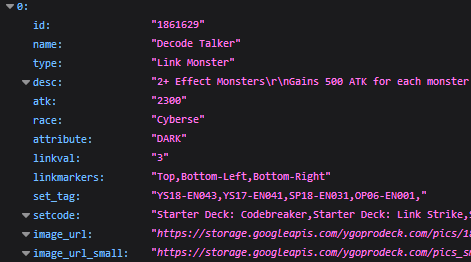 linkmarkers - The Link Markers of the card if it's of type "Link Monster". archetype - The Archetype that the card belongs to. We take feedback on Archetypes here. set_tag - Every Card Set code number this card belongs to. setcode - Every Card Set this card belongs to. ban_tcg - The status of the card on the TCG Ban List. ban_ocg - The status of the card on the OCG Ban List. ban_goat - The status of the card on the GOAT Format Ban List. image_url - The URL for the image. image_url_small - The URL for a smaller sized version of the image. We are working on to soon include price data as part of the response information. If a piece of response info is empty or null then it will NOT show up. For example, Link Monsters have no DEF, Level or Scale value so those values will not be returned. The following is a list of examples you can do using the possible endpoint parameters shown above. Our API only officially supports English as a response language but we are adding unofficial languages bit by bit. What do we mean by unofficial? Translations may not be accurate and card information may be out of date. The other language APIs are essentially used to have a foundation of what you want to build. Please do not email or contact us about adding languages or to continually update other language information. Card images can be pulled from our Google Cloud server but please only pull an image once and then store it locally. If we find you are pulling a very high volume of images per second then your IP will be blacklisted and blocked. Our card images are in .jpg format and are web optimized. All of our cloud URLs will either be https://storage.googleapis.com/ygoprodeck.com/pics/ or https://storage.googleapis.com/ygoprodeck.com/pics_small/. You pass the ID of the card to retrieve the image. The image URLs are found within the JSON response as both image_url and image_url_small. Since v3: Card images are now properly returned without slashes being incorrectly escaped as it was with v2. 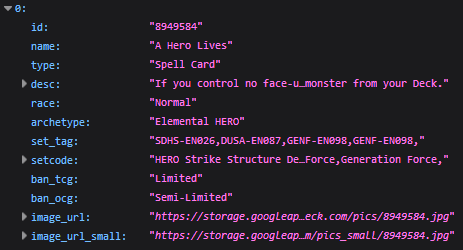 The Random Card endpoint can be found at https://db.ygoprodeck.com/api/v4/randomcard.php. This follows the same rate limiting procedures as the card lookup endpoint. Cache Control is disabled for this endpoint so it should always provide a fresh card. If any GET parameters are found in the call, then it will return an error. The main features of v3 is more thorough error checking. All error codes now return a correct 400 response header. Almost every parameter will now return an error code if an invalid value is passed to it (as opposed to ignoring it and returning all cards like in previous versions). The user will also be prompted on all the correct possible values to pass so they aren't left guessing. The only way to return all cards now is by having 0 parameters in the request: https://db.ygoprodeck.com/api/v4/cardinfo.php. If invalid parameters are sent, an error will also be returned. This should save users bandwidth on receiving large requests when requesting malformed urls.